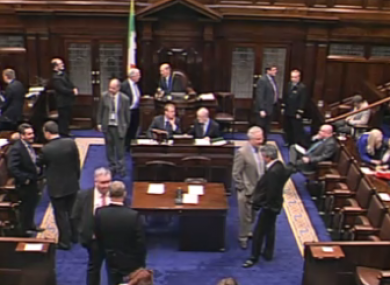 The Dáil votes by 111 votes to 20 not to approve Clare Daly’s legislation; Fianna Fáíl joined the government in defeating it. THE DÁIL HAS voted to reject draft legislation which would have permitted abortions to be carried out in Ireland under limited circumstances. The legislation, put forward by Clare Daly of the Socialist Party, was rejected by 111 votes to 20. All TDs from the Fine Gael and Labour parliamentary parties voted against the legislation, as did all 16 of the present Fianna Fáil TDs. Sinn Féin voted in favour of the bill, as did ten of the independent and other party TDs. Independents Noel Grealish, Mattie McGrath and Michael Healy-Rae were among those who opposed the legislation. Former FG member Denis Naughten, and former Labour TDs Willie Penrose and Tommy Broughan, voted No, though former Labour TD Patrick Nulty voted in favour. The electronic vote counter – which had shown 109 of the 111 votes when the allotted voting time had expired – showed three Labour TDs absent, and 19 Fine Gael members, many of them cabinet ministers. The defeat of the Bill had been signalled last night when health minister James Reilly confirmed that the government “cannot accept” the legislation as it currently stood, because it was “lacking in certain legal respects”. Reilly said Section 6 of the bill – which outlined circumstances under which a GP could be presumed to have obtained consent to treat a pregnant woman when there were no means available to determine her consent – may have been in conflict with the Constitution. While the Bill as drafted here tonight goes some way to address the A, B and C judgment, the government is clear that in its current form it cannot be accepted because it is lacking in some legal respects. The government had appointed that expert group earlier this year following the European Court of Human Rights ruling in late 2010 which criticised Ireland for failing to legislate for the right to abortion in limited circumstances, in line with the Supreme Court ruling in the X Case in 1992. Speaking before the vote, Daly condemned Fianna Fáil for its expected rejection of the Bill, and urged Labour members to reconsider their No votes. She repeated her original comments from last night in stating that the report of the expert group on the ruling in A, B and C versus Ireland would not return its report until July, meaning it was unlikely that the government would bring forward any legislation itself within a year. Email “Dáil rejects proposals to allow limited abortion in Ireland”. Feedback on “Dáil rejects proposals to allow limited abortion in Ireland”.